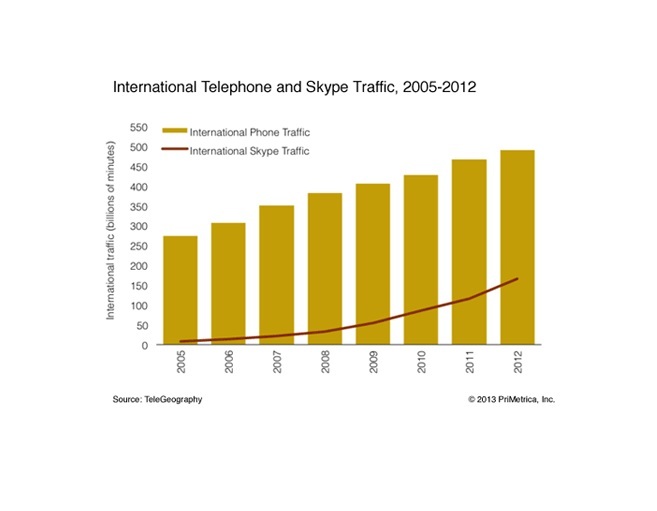 Yesterday Skype went over 80 million concurrent users online. Steven Schoen from Hawaii was wondering if the World Cup Football (wrongly called soccer in some countries ;-) could be an explanation. The World Cup begun on June 12, with Brazil playing against Croatia. My kids being half Brazilians I was happy for them with the score, but I have to admit that a draw could have been justified. And yes indeed, there seems to be a rise in Skype usage from that date on. Coincidence or cause and effect? Do people call each other more before, during and after the match? Do they stream the match through their webcam? If it is a World Cup effect, we will see a Skype usage the final match, taking into account that during Northern Hemisphere summer there is usually a strong drop in Skype users online. On Monday Steven Schoen from Hawaii, one of my remaining “real” blog readers (I almost don’t post the last months!) warned me that « suddenly » the Skype concurrent users online reached 78,539,279 around 18h00 GMT. 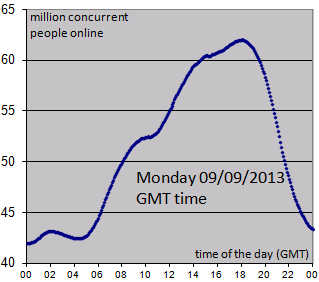 Yesterday I saw concurrent users online go above 79 million, also around 18h GMT. 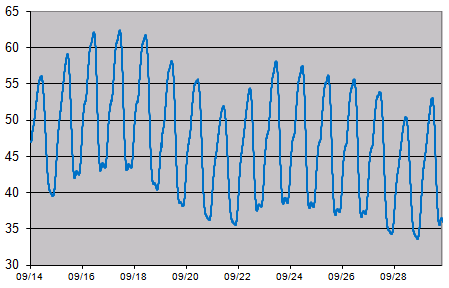 Strange, because the last months there was a downward trend, from about 60 million at peak time in the beginning of the year, to about 56 million at peak time last week. 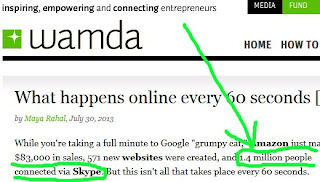 Probably Skype changed their algorithm to estimate the concurrent users online. But this is a guess! Question: can we trust this number? I doubt about it, as does Steven! Where are the 70 million? 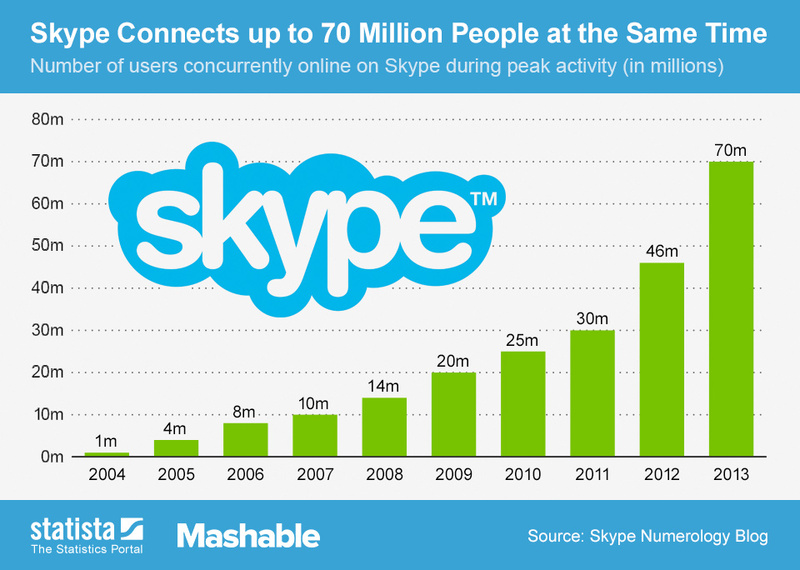 End of August we reached a surprising high number of more than 70 million concurrent Skype users online! 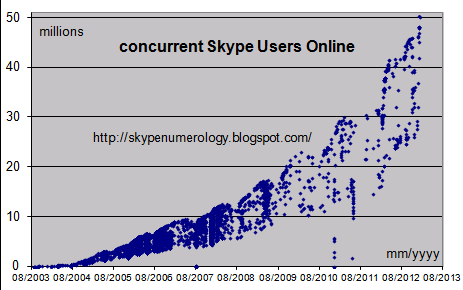 The next graph represents the number of concurrent Skype users online on September 09, 2013. The fluctuations are mainly due to day and night usage of the users in the different time zones. In 2008 I tried to explain the shape of the curve, see my post. Skype growth stopped? Or still adjustments due to the Outlook.com integration? It seems I was right: 70 million users online was "Outlook.com fake"! Two weeks ago we jumped in less than 10 days from 60 million concurrent Skype users online to more than 70 million on August 27, very unusual, never happened before. And also not normal for the Northern Hemisphere Summer: usually no growth of users online at all during this period of the year. 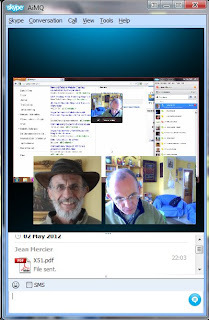 See the bottom of the screenshot of my “old Skype client”, taken on August 22, at 15h26 Belgian time (GMT+2): it shows 67 million people online. Well, I follow Skype numbers since the very beginning of Skype’s birth in August 2003, and despite the very scarce information provided by the new owner Microsoft I developed a feeling concerning “normal or abnormal” changes in users online behavior. Therefore I dare to make some guesses. Sometimes they are wrong, sometimes they prove to be right. In my post of August 27 I guessed this was a “fake growth” due to Outlook.com users logging unknowingly on to the Skype application, or double logging in, and it seems I am right. Last week it never went over the 62 million people online, and also today, the maximum I saw was 62 million and a bit. Such a downfall of about 8 million people online is NOT usual, never happened either. So, what happened? Did a lot of Skype users abandon Skype last week? I don’t think so! Did Skype change the way it calculates the users online? Or change something in the automatic logon of Outlook.com? Probably something like the two last guesses. Anyway, what matters, Skype usage is still growing, no doubt about that! Nice to have readers ! Well, of course I blog hoping to have readers! Is this narcissism? Somehow yes ;-) One of my fanatic readers, Steve Schoen from Hawaii gave the link to the following chart. Not my chart! But yes, made by using my data. Thanks Statista! They mentioned it! Not everybody is that fair! Nice graph by the way! And, while I am busy with “myself”, The Guardian also commented on one of my last posts, see here. How long will I continue to blog? Well to be honest, I don’t know. Microsoft doesn’t provide separate numbers for the Skype business, not that I know at least. The only source now is the RSS feed of Skype Users Online. Even the Download Counter (on the same feed) has made some unexplainable strange jumps the last months and isn’t reliable anymore for that reason! And my blog is mainly about numbers … so, no numbers, no posts! Happy Birthday Skype: 10 years! And some real examples here in this article! and I had also quite some friends or even customers abroad! I still have friends abroad of course! 70 million people online at the same moment: is this real growth? We went in about one week from 60 million concurrent Skype Users online to 70 million today! Never such a growth in the past! The phenomenal growth of the Skype concurrent users online (see the number at the bottom of your Skype client window for older versions or the Skype RSS feed here) is clearly due to the availability of Skype through Outlook.com (the former hotmail service of Microsoft) as announced some days ago here. But, is it real growth? I mean, will people logging in in their Outlook.com mailbox really use Skype? First, if I understand it well, everybody (from a limited amount of very important countries) has Skype enabled whenever they go into their Outlook.com account. Therefore they come online without really asking for it! Second, some people have probably not merged their Skype account and their Outlook.com (or Microsoft) account. Therefore they are « twice » online « on Skype ». This is therefore (temporarily?) inflating the real number of persons online. Be aware that I was NOT a Hotmail user, and I am still not an Outlook.com user. Therefore I speak without having tested anything. So, feel free to criticise! Question? Will all these Outlook.com users use Skype? 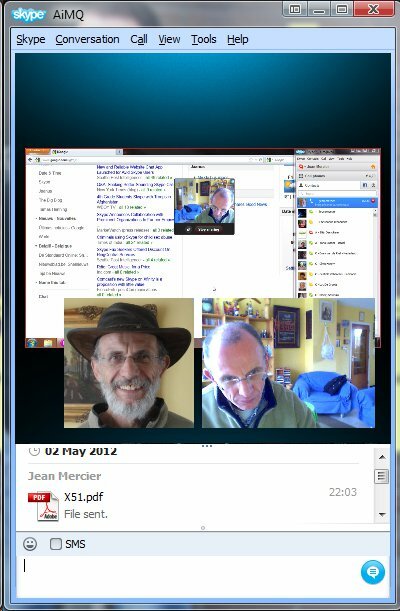 Skype is known since a long time, and most people know about its existence. So, some will be tempted to try it, others tried it in the past and will still not use it, and some are even not interested in trying it at all. 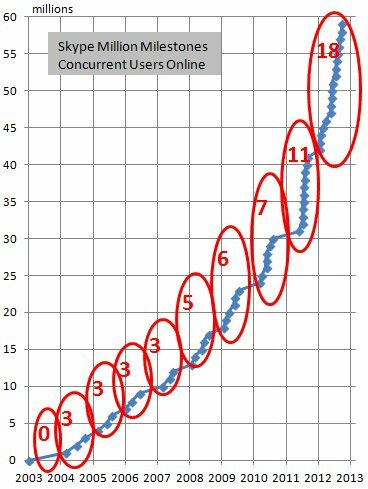 Therefore, the growth of concurrent users online is in my humble opinion partially a false growth. Today, one of my blog readers (Steve Schoen from Hawaii) told me that we crossed and 60 million concurrent people online and 61 million! 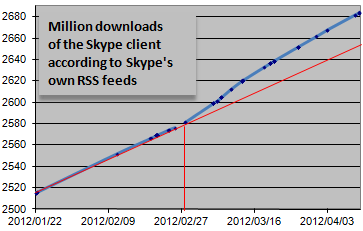 I checked: indeed, 61.891.799 according to the RSS Feed of Skype itself! This is closer to 62 million! Perhaps we even reach it today! These new records are quite early in the new season. It happened only once that a million milestone was crossed already in August, and this was on August 29, 2006! UPDATE @ 17h40 GMT: 62 million reached! Wrong transcript : 1.4 million WHAT ? I read this title on the web today: What happens online every 60 seconds [Infographic]? They pretend that 1.4 million people connect to Skype every minute. This would mean that, in a period of 24 hours, if each one of these connections is from different people, 2 billion different users connect every day. With a World population of 7 billion, this doesn’t seem very realistic! And with a maximum of nearly 60 million concurrent users online at peak daytime, it isn’t either. Of course, several people connect and disconnect several times per day. 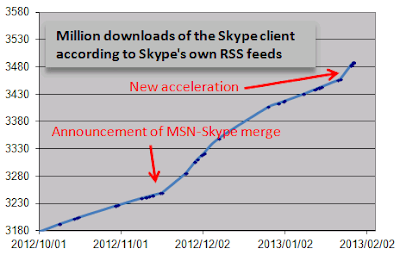 A more realistic estimate is the Skype estimate of 280 million active users some months ago, see my post of April 7. So, what is the possible explanation about this 1.4 million number? Well the number is perhaps right, but the transcript is wrong, see the original graph on "Qmee finds out what happens online in 60 seconds". On the pie chart the following is written: “1.4 million Minutes Connecting with Each other” … and this is quite different from the “1.4 million people!”. Inspiring entrepreneurs wamda? Please do your homework over! Somewhere in May Skype passed the phenomenal number of 59 million concurrent people online at peak daytime (around 17h30 GMT, when as well Europe, Africa as the Americas are online). This is already, at peak daytime, 1 out of 120 human beings online. 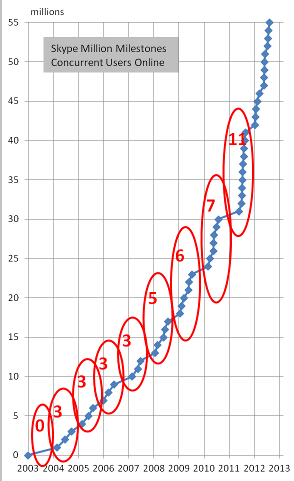 During the Northern Hemisphere “School year” 2012-2013, this million milestones were crossed 18 times, the absolute Skype record, compared to 11 the previous year and 7 the year before (see the chart below). Where will this stop? When each human being on the planet has a Skype account? Skype is available on more platforms, even available for the Windows phone and Linux. More people online “all the time”, because of mobile devices connected “all the time”. Videoskyping is so nice, with the beloved or grandchildren far away or even “pets” (lots of crazy people in the World ;-), or are it the pets that are crazy?). On weekends less people are online: they stay a longer time in bed, go on excursion, visit the relatives, play football, etc. And don’t forget that Christianity Sunday is Friday for the Muslims and Saturday for the Jews, therefore in some countries weekend begins earlier in the week than on Saturday! I noticed also less people online on national Holidays of big countries, and in Holiday periods like now! But, why almost always million crossovers (and Skype online users records) on a Monday? I guess some new Skype users install and try Skype when they are home on Weekend. Therefore, when on Monday all the “old users” come online after a quiet weekend, they are joined by the bunch of new weekend testers. Some days ago Skype proudly announced that their users spend a total amount of 2 billion minutes per day on Skype. Some 2 months ago Skype told the world that there were more than 280 million active users each month, see a previous blog! Using these two numbers, this means that the average daily time spend on Skype calls is 7 minutes per active user! A lot of them probably with video, therefore more enjoyable than an ordinary phone call! Yesterday, a Sunday, 47 million, and more than 48 million people online today. So, this means something is happening. Both announcements were made on January 10 on the Skype Blogs! 47 million people online at about 18h GMT, thanks to Steven Schoen from Honolulu – Hawaii who warned me! On weekends Skype usually doesn’t break records. Million Milestones were never crossed on a Friday (Muslim weekend), Saturday or Sunday (Christian weekend), and now for the first time ever a Sunday, strange, almost funny! And Happy New Year to all my readers! “Skype for iPhone and iPad Hits over 120 Million Downloads and Releases New Versions”. 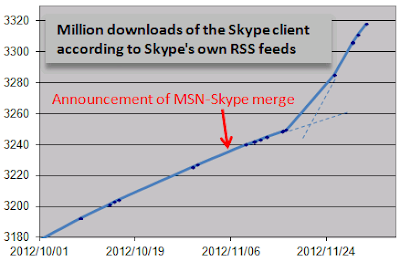 In my opinion it is more the MSN-Skype merge. The download graph show clearly a bend around November 20, with download speeds as high as 5000 clients/minute, instead of the 2000 /minute at other moments! Skype announced some days ago that it will integrate MSN and Skype. 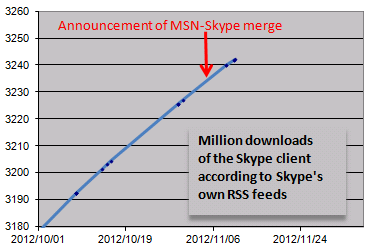 In fact, from what I understand, MSN will disappear and be swallowed by Skype. I would have expected an acceleration of downloads of the Skype client (and of users online), but to my surprise … nothing yet! See the graph below. Why? Well, first, the migration to Skype is still not mandatory! Secondly, and this is a guess, some functionalities will be lost, and probably some MSN users are reluctant to move now, see the questions and answers here. But there is hope! One of the questions is “Can I show up as offline to specific contacts?” and the answer is “You can’t yet hide from individual contacts.” The “yet” is revealing that they are working on it! This is an old “desire” of quite a lot of Skype users, read their forum! According to one of my blog readers, we reached 43 million concurrent users online today. Thanks, Steve Schoen, from Hawai. "I think the surge in usage is somehow school-related".